I had a discussion with a few people on twitter recently about how good fish fingers sandwiches are and I was reminded about the time I made this sandwich. From there I just had to order some fish fingers and recreate it all over again. But fish fingers are something that I find are constantly rising in price as quality of fishing and ingredients continue to rise and restrictions become increasingly enforced. One thing that has confused me is how brands have decided to try make fish fingers ‘fun’ because as a child I do not really know anybody who hated fish fingers because of how they looked. 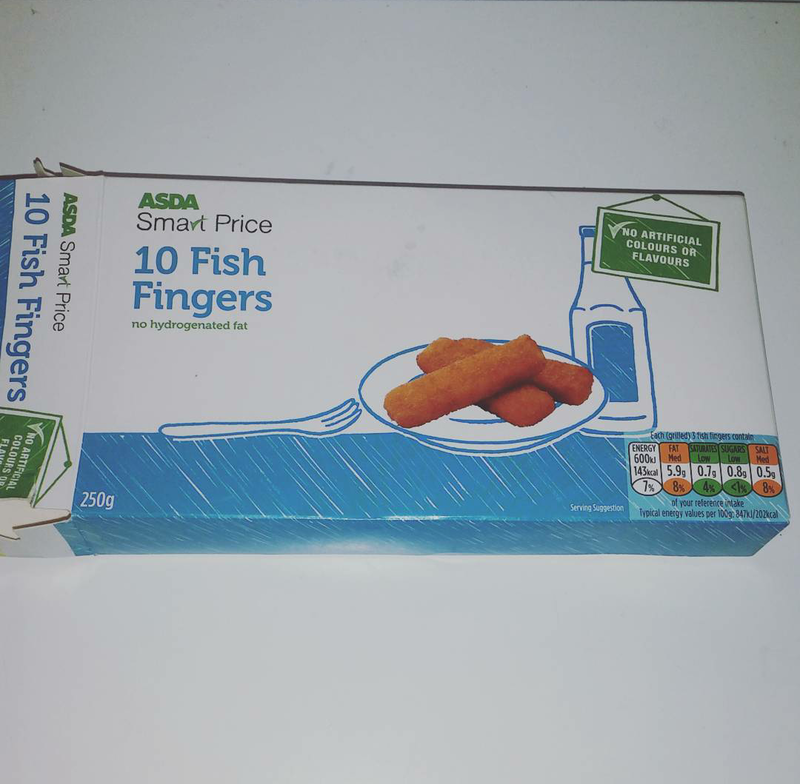 As a result to find fish fingers you have to look at the “fish fingers and shapes” section of the website but if you do you can find this box of ten ASDA Smartprice fish fingers for 60p (half the price of this box of eight Birds Eye ones). You might be thinking that the Birds Eye ones are probably more expensive because of the fish content or the fish that is used. They both contain Alaska Pollock but actually the ASDA ones have 9% MORE of it than the branded ones despite being a couple of grams per fish finger smaller. So in this case, despite them being literally a smidgen smaller, the ASDA ones are by far the better value for money and pence to fish content. If you give the fish fingers a little bit longer to cook than the recommended time on the instructions these will crisp up and have just as crunchy results as the slightly more breadcrumb coated brand ones. I also find that because they contain slightly more fish that these need a few minutes longer to ensure they are really piping hot in the middle but the extra time it takes is not really an issue especially where they do not need constantly watching over. When taking them off of the grill, or pan depending on your cooking method, you need to ensure that you get properly underneath them as otherwise the layer of crumbs can come away from the fish too easily (though it will remain as a whole piece if this happens to reassembly is not too difficult). But other than that there is literally no difference in quality or taste between these or any of the other brands that I have tried and when these are so much cheaper then these work out to be a real bargain. Great value, fantastic taste and pretty much identical ingredients to standard brands. Would highly recommend you getting whether you just like them every now and then or rely on them for feeding the kids in a hurry. This entry was posted in Food and Drink, Product Reviews and tagged asda, cheap, cheap eats, children, classic food, comfort, comfort food, discount, eat, eating, fish, Fish finger sandwich, Fish fingers, fish friday, food, Food and Drink, food blog, food blogger, food bloggers, food costs, food pictures, food product, food review, food reviews, foodie, lblogger, lbloggers, life, Lifestyle, lifestyle blog, lifestyle blogger, lifestyle bloggers, meal, review, simple meal, smartprice. Bookmark the permalink.